The mind is like a traveller…it knows where to go when. But first I need to tell you all about being super gullible! Now central to this tale of Deep-fried Haggis legs are 2 wind-up merchants, let’s call them J and P (and I say no more). Men of deceit, preying on the innocent, in this case – me. 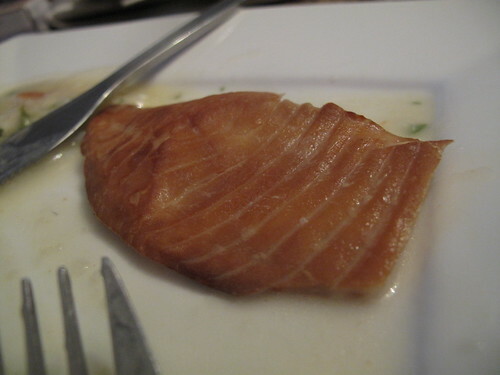 Picture this: a short discussion on regional foods soon leads to Google and Wikipedia for confirmation. I am shocked to discover that the Haggis I know of not only has its entrails used in a sausage-like but actually comes from a specific sheep-like animal. Apparently, the Haggis sheep is a peculiar animal in that it lives in the Highlands of Scotland somewhere and has one set of legs (fore and hind) which are shorter than the other. The male and female have the shorter legs on either side….they can run in only one direction. Infact, by the end of the day I was practically begging my Scotsman, J to do a guest post. This is sorted, my knowledge of Scottish history is elevated and a request for Haggis legs from London is put in. Fast forward to the sausage and bacon aisle at Waitrose in Welwyn Garden City. I walk the aisles and the search for Haggis is on but blanks are drawn. A weary eye cast over the Butcher’s wares and nothing Haggistic meets the eye. Apparently, the existence of the Haggis as sheep has been a century – old standing joke for unsuspecting people…..just like me. Gullible, unknowledgeable…lacking in appropriate knowledge of cultural detail so that as soon as the discussion began, P and J…without any consultation with one another (no pinching, no giving of the eye, no nothing) could successfully pull it off and direct me to ‘convincing info on the internet ’. This is no ordinary joke. There are pages of detail on the Evolution of Haggis, a Haggisclopaedia and more. Do not believe a word you read! Don’t believe everything you see on the internet! Be confident and go with your gut feeling….except if you don’t have one, then you’re at the mercy of…men of deceit. Anyhow, none of the recipes I present today involve wind-ups. 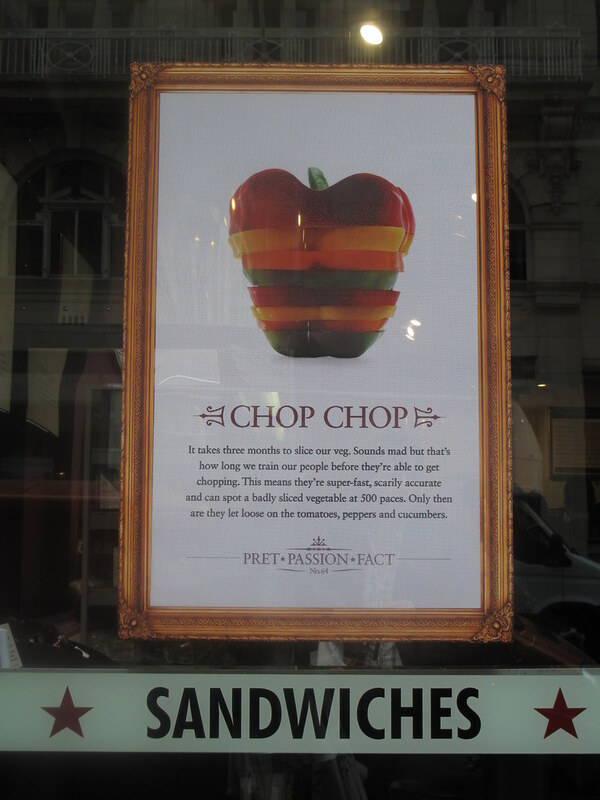 Instead, reminders of a trip to London and a sign in a Pret a Manger window….and a recipe from way back when I was in Nigeria are the key triggers. They’re fool-proof, achievable, delicious and easy to make. The first time I saw this recipe about 4 years ago, it was made by James Martin on BBC food. I ended up tea-smoking loads- chicken breasts to top the salad, fish for the rice and so on. 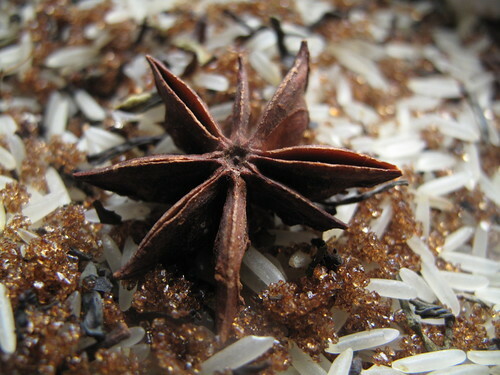 The whole process gives the resulting food amazing fragrance and texture but involves careful planning. My trip to London brought it all back to the fore of my cloudy mind….. It could result in a very smoky kitchen so ensure all windows are wide open and your extractor is on! Ensure the cooking area is well-ventilated. I had all my doors and windows open just in case it got too smoky but it was fine. 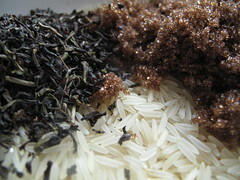 Mix the rice, sugar and tea leaves together in a bowl. 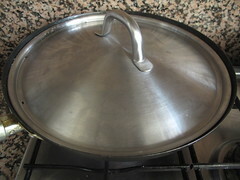 Line a wok with triple-folded (heavy-duty) kitchen foil and pour the mixture on top. If using any flavourings, add them now. Put the wok on the stove pot and cover tightly. 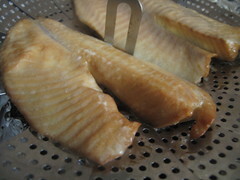 Let heat up for 2 – 3 minutes on medium heat till it begins to smoke. The heat is important as you want the food to taste smoked and not charred so watch it. As soon as it starts smoking, remove the cover and place an oiled trivet/metal steaming basket above the smoking mixture. If you don’t have any of these, cover the smoking mixture with a double layer of foil onto which you’ve drizzled some oil. 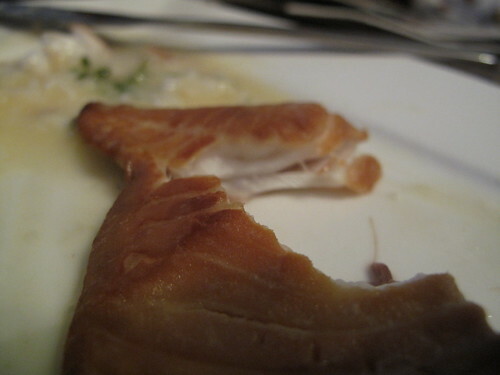 Place the fish on it. Replace the lid of the wok and leave to smoke for about 5-7 minutes. Take off the heat and set aside till ready to serve. 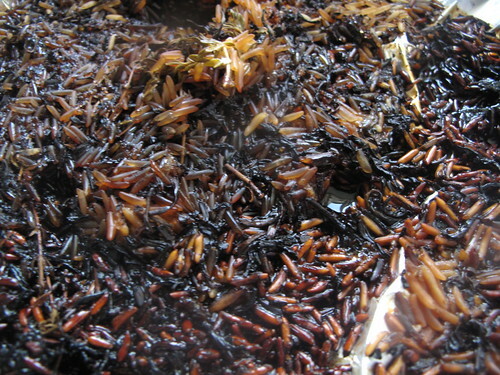 Dispose of very burnt rice mixture! 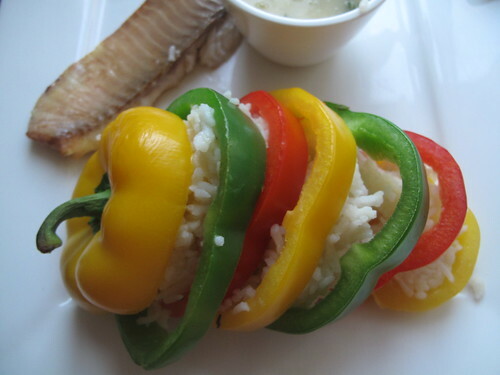 Like I mentioned earlier, this recipe was born from a sign in a shop window…of slashed peppers. As soon as I saw it, ‘the apple fell’ and I knew that the case was closed. This had to be done…but how? And so began the journey to make the peppers. Let me say upfront that next time, I’ll do it differently and there will be a next time! 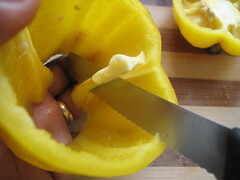 First slice off about 2-3 cm off the top (stalk and all) to create a cap. Then deseed and devein peppers. 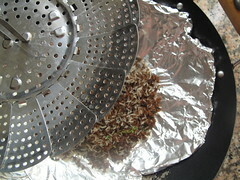 Rinse out to get rid of the seeds. 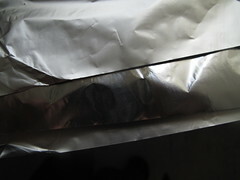 Next, slice of (at least) 3 – 4 rings about 1cm in thickness ensuring you leave a base of about 2-3 cm. (Note that I didn’t do mine this way and it gave me some issues when trying to slice off rings). You want to end up with enough rings to build a stack! Now take a look at the end. 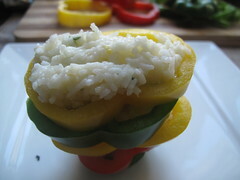 If it is too pointy, slice a little bit off so the pepper sits well. 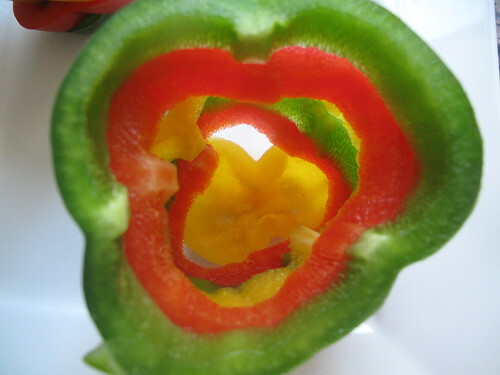 Do this for all 3 peppers. Now if I were you, I would marinade the peppers in a nice mix, say a Yakitori mix or one of your choice and let it ganer flavour for about an hour. 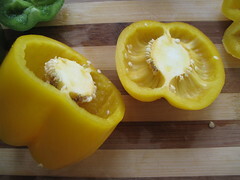 Then I would gently cook the peppers on a grill pan or in a frying pan for a short while to seal in the flavours and yet retain the colour and crunch. I didn’t do any of the above….and I’ve learned my lesson though I am super glad that I tried it and now have some fix-it plans. Then the tricky part begins. 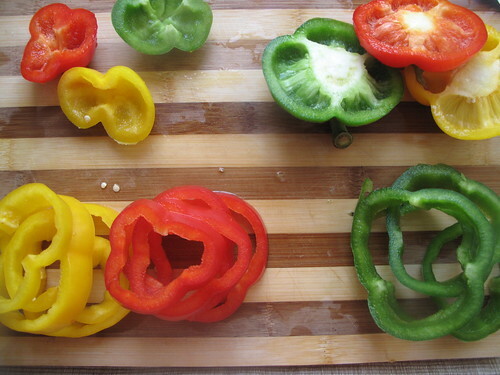 Essentially, you’re trying to create a new bell pepper out of different slices. Get it? 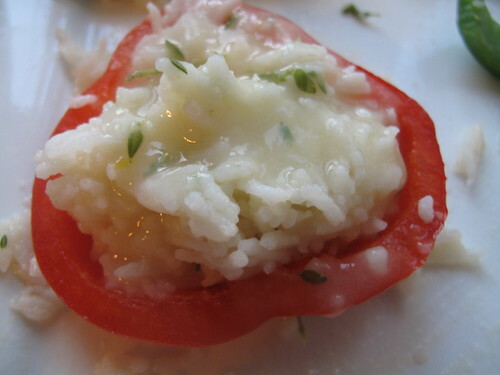 So, get out your serving plates and lay the base of one pepper on the plate. 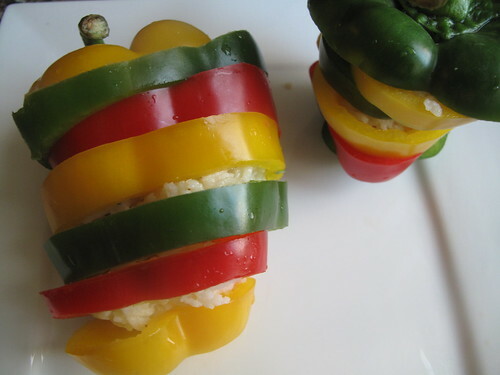 Select a different colour of pepper with a diameter slightly larger than the base and continue to stack them up till you have a ‘complete’ tri-colour pepper. 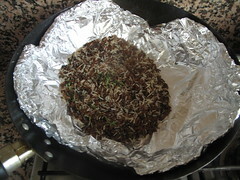 If you’re brave and want to warm it, put it in the oven for 5-7 minutes at 180 degrees centigrade to heat through. It was a beautiful dish. The colours were vibrant…great concept but a bit lacking strong flavours. I tried to heat the peppers up before serving by placing them in the oven, watching carefully so they wouldn’t tip over. They made it out…barely and the rice got hot but…the peppers were a bit crunchy and not as tasty as I would have liked. 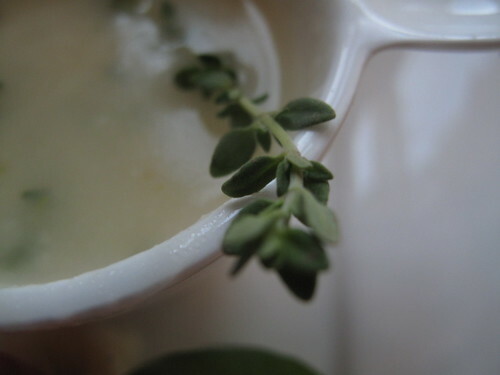 However, the Lemon thyme sauce compensated for it so…. overall I was pleased with the idea and will definitely make it again. Begin by making a roux. 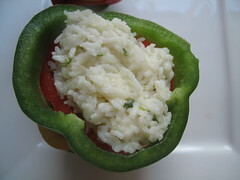 This gives the rice some moistness and ‘juice’. In a large enough pan (to take all the ingredients), put the butter and flour and let cook slowly on low heat for 2-3 minutes. You want the flour to cook well so it doesn’t leave a pasty taste in the mouth. Add the Lemon thyme. Slowly drizzle in the water or stock, stirring continuously till you’ve put it all in. 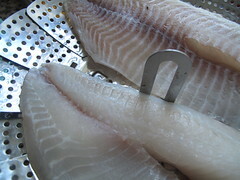 Bring to the boil – about 2-3 minutes and then set aside to cool. Season to taste and add optional ingredients as you desire. And that’s it. My special, no deception meal 🙂 Hope you enjoy it. So have you been wound-up recently? Did you take it well? 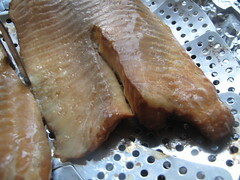 and have you (had) tea-smoked food before? Did you enjoy it?